Germany: Allied Occupation: American, British and Soviet Zones 1947-48 24 pfennig, nineteen colour trials with uncleared background. Mounted on card. 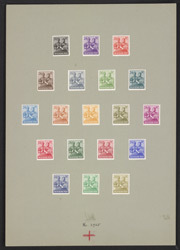 bl.uk > Online Gallery Home	> Online exhibitions	> Philatelic rarities	> Germany: Allied Occupation: American, British and Soviet Zones 1947-48 24 pfennig, nineteen colour trials with uncleared background. Mounted on card.